Remember that game, Pictionary? The one where you’re secretly shown a word and then need to draw an image of that word while your team guesses what it is before time runs out? Well, whether you loved it or hated it…it has played an active role in Gurmat camps for well over a decade…of course, only after “Sikh Jeopardy” got old. Pictionary seemed to be our default activity when us instructors had no idea what else to teach, needed to fill time, or were too lazy to come up with a real lesson plan. It took no effort to prepare and the kids loved it! We would just write Sikhi-related words or events on a card, like “Kirpan”, “Vasakhi”, or “Dastaar” and we were ready to go. We must read such reports and present them … anywhere and everywhere … to anyone who will listen: our gurdwaras, our local Amnesty International chapters, student groups, talk radio, public television, newspaper op-eds, etc. We must also create awareness of these findings in whatever format we can – through music, art, theatre and poetry. I was impressed to see the Sikh Student Association here at the University of Maryland acting on this principle. The SSA, in conjunction with other student groups, is sponsoring a free concert on April 3rd, 2009 to mark the 25th anniversary of the 1984 Sikh genocide. 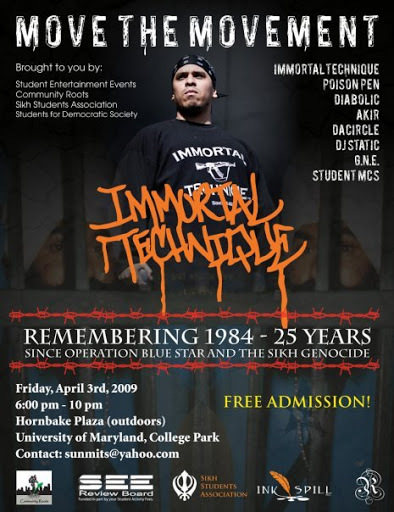 The featured performer for the concert is Immortal Technique, an up-and-coming rapper who attracts a large and diverse audience, especially amongst college students. His intense style, controversial lyrics, and willingness to approach political subjects, such as the mid-east conflict, have made him a fan favorite amongst the politically aware. It is refreshing to see students think “out-of-the-box” in remembering 1984, by attracting a mainstream artist and joining forces with other student activist groups under the tagline “Move the Movement.” The SSA plans to distribute background material on the 1984 atrocities and subsequent human rights violations, as well as feature short video clips and interviews with victims in between acts. I hope other groups will take from this example and implement similar creative ideas as opposed to gathering in front of embassies and consulates, shouting at empty buildings. I never really understood that concept. Why would we stand outside of the Indian consulate demanding our rights? If the Indian government orchestrated these crimes, why would they be interested in our demands or empathizing with us? I’m equally uncomfortable with candlelight vigils. This was popular as I was a student, as such vigils would pop up every June and November at gurdwaras and university campuses all throughout North America. I understand the need to reflect and commiserate on the atrocities of 1984, but there is something very passive about a vigil, as though we are community in mourning. Our history teaches us to be in Chardi Kalaa under such struggle, so why mourn? Besides, it is not as though 500 years have passed, it’s only been 25. Survivors are still suffering (see Widow Colony), and many of the architects of the Darbar Sahib attack and anti-Sikh pogroms are active politicians. Forget the candles! We need to expose the truth, educate our communities, and put the architectects behind the State violence and human rights violations behind bars, as per the law. I realize I’m being critical, and even a little self-critical as I’ve participated and organized such protests and vigils, but as 25 years have passed – we need to pause, reflect, re-strategize, and find more effective and productive ways to present our case. What if one of the presenters at this past Sunday’s Academy Awards wore a “Free Punjab” T-Shirt? Even if it was a medium-famous star, there would be a buzz throughout the internet the next day on what exactly that T-Shirt was about. I’m a strong believer that if this movement gains even a hint of popularity from Non-Sikhs, Sikh supporters will come out of the woodworks. I commend the SSA on this endeavour, and hope to see a great turnout on Friday! Agree? Disagree? I’d love to hear your thoughts! What is unique about this report is that it does not focus on individual narratives or specific accounts of the human rights violations in Punjab, but instead provides a statistical analysis – based on quantitative research – of fatal violence across Punjab during the conflict between 1984 and 1995. This analysis brought together six data sets comprising of more than 21,000 records. It incorporates documentation from several different fact-finding initiatives over the last two decades investigating human rights violations in Punjab, as well as the Tribune newspaper and recovered logbooks from local cremation grounds. So you may ask yourself – after collecting the data, analyzing it, and producing this report – the end result is proving the violence in Punjab was not random? The Indian authorities’ claim of human rights violations in Punjab being an “aberration” is, in fact, false? Well … didn’t we already know that? Any Sikh who has read the accounts, heard the stories, watched the interviews, and lost family members to the violence in Punjab knows full well that these atrocities committed by the government were no aberration; they were widespread and systematic. But up until now, most of the research has focused on individual stories and experiences. These personal narratives are powerful, heart-wrenching, and inspiring. They allow us to understand the experience of the victim’s families and, more importantly, allow their voice to be heard. In order for us to heal as a community, it is essential for us to reflect and commiserate. However, if our goals are something bigger – if we intend to seek justice for the thousands of lives lost, if we are determined to change policies and hold the guilty accountable – such accounts will not be enough. Some may say that whether one hundred lives, one thousand lives, or ten thousand lives were lost doesn’t really matter; if just one life is lost unjustly, that should be enough for public outcry. During a recent presentation on 1984, I quoted the number of casualties during the anti-Sikh pogroms with the lowest number I could find – in the Indian government’s own White Paper. Hands quickly went up with objections that my number was too low. Participants then shouted out numbers that were four or five times as much. Perhaps they are correct, but until we have numbers based on some verifiable evidence or technical analysis, our hands are tied. Throwing out inflated or inaccurate numbers based on anecdotal evidence can only weaken our case. Years ago, Dr. Cynthia Mahmood (Associate Professor of Anthropology, University of Notre Dame) was in town speaking in a panel discussion at the University of Chicago. I was to meet her and a few of her students for coffee afterwards; since I arrived a bit early, I listened to the panel. The discussion was on torture, and the psychological and sociological effects it has on the victims, families and communities involved. I was stunned to hear that two of the panelists had done their field research specializing on Sikhs and the violence in Punjab during the 80’s and 90’s, and nearly all of the panelists referred to the “Punjab Conflict” in the papers they presented. I looked around the room; I was the only Sikh in sight. I started to wonder … where else are these panel discussions going on where the “Punjab Conflict” is being discussed? Are human rights lawyers and academics huddled around tables in conference rooms throughout the world trying to seek justice for the thousands of lives lost at the hands of the Indian government? I started to reflect on the day I walked into my university’s monthly Amnesty International meeting over a decade ago. Each month, Amnesty would send us an Urgent Action Appeal to work on. To my surprise, that month’s case was the disappearance of Jaswant Singh Khalra. I was shocked! This was an appeal for a Sikh, yet neither my Sikh peers nor our gurdwara management knew anything about him. And here were these Black, White, and Chinese students diligently writing their letters to the Indian government urging them to investigate Khalra’s disappearance. They didn’t really care that he was a Sikh, all they knew was that an innocent human rights activist was abducted by the police, and something needed to be done. Will such reports end up on library shelves collecting dust? I guess that’s up to us. The academics and human rights activists of the world have done the research, they have documented the facts and figures, they have done the leg work for us. They have armed us with the truth; it is now upon us to bring truth to power. I truly hope the efforts of Ensaaf and their partners will take this case to the highest courts of the land but, as Khalra said, we must also take this to the “biggest court of all … the court of the people.” And the activist in all of us is responsibile for that. I don’t believe this report alone will be enough to hold the guilty accountable, but it does put them on notice. If the Indian authorities make lofty claims and simply dismiss the injustices committed in Punjab, it will not go unchallenged. Ensaaf and Benetech indicate they plan to continue their research, so they can draw further statistical analysis and ultimately present the full magnitude of the conflict. I commend Ensaaf and Benetech on the release of this report and encourage them to keep the flame burning. Such reports are an invaluable stepping stone toward exposing the truth and achieving justice. As per our routine, we would conclude our evening Divaan with a counselor singing Naam Simran, as I would periodically dismiss each group from the Divaan hall, where the campers would then head over to the cafetria for a snack before bedtime. I believe magic happens at camp. As for the boy who wanted to stay back…I let him. As a matter of fact, I dropped my things and sat beside him too, and we listened to Naam Simran until it stopped. For me, the Naam Simran ended when the counselor stopped singing, but judging from the look on the boy’s face, he could still hear it. I’m not sure what compelled me to stop and sit next to him. Perhaps I longed for what he was feeling, or maybe just hoping that magic would rub off on me. I remeber the first time I was ever a counselor. I was 18 years old and my first task was to lead an orientation for the youngest kids at camp. After several unsuccesful attenpts to a lead a discussion, I went with what I knew…and just did a bunch of jakaray! I thought perhaps they didn’t hear me. I said, “Are you proud to be Sikhs!” Still, silence…then all the kids started looking around at each other in confusion. Recently published on SikhChic under the title 1984 & I:Forget? Never! Years ago, I was giving a local church group a tour of our gurdwara. While I was showing them around the langar hall and explaining the history and significance of langar, I noticed that I was losing my audience. It took me a second to figure it out, but it appeared they were fixated on one of the images on the wall. It was the painting we’ve all seen of Bhai Taru Singh being scalped and blood running down his body. I’m not sure what shocked them more – the graphic painting itself, or the five-year-old boy sitting beneath it, quietly eating his meal. For just a second, I put myself in their shoes. I looked around the room and saw pictures of Sikh martyrs from the 18th century – a man being boiled alive, a person being sawed in half, two little boys being bricked alive, and an old man with his fingers getting chopped off. And I thought to myself … is this really necessary, the depiction of these scenes in these surroundings? I started to wonder: are these images really what we want to convey to our visitors? Shouldn’t we find something that depicts universality and love for humanity? Especially after 9/11, shouldn’t we be displaying a softer image of Sikhs? After all, this dining area is a place for us to share a common meal, and little children play down here, for God’s sake! Is this really appropriate? Sikhi is a loving religion, with a universal message that advocates equality and human rights for all. These were revolutionary ideas during the Guru’s time and preserving and strengthening these ideals under oppressive rulers came at a tremendous price. Gurus were martyred, their sons bricked alive, and countless other brave Singhs and Kaurs gave their lives for the Chardi Kalaa of the Khalsa Panth. Sometimes I look at the numbers and I am overwhelmed. Roughly 25,000 Sikhs gave their lives along with Banda Singh Bahadur, 20,000 under Zakhriya Khan’s rule, 10,000 in the Vada Ghalugara (The Big Holocaust), and 60,000 at the hands of Ahmed Shah Abdali. Within half-a-century, roughly 200,000 Sikh lives were lost. Waheguru. Such figures can be depressing, but somehow, as a child listening to the stories of our collective struggle, I felt inspired. Not by how much we’ve suffered, but by how much we’ve overcome. No matter how hard we, the Sikhs, are suppressed, we always seem to rise again … stronger! When I reflect on all the sacrifices, I can’t help but think that every one of those lives lost, every drop of a blood was for me, so that hundreds of years later, I could confidently walk the streets – anywhere in the world – with my head held high, proudly bearing the gifts of my father. I am not saddened, but I am in awe of how a seven-year-old and a nine-year-old held the fate of Sikhi on their shoulders and proudly gave their lives before their faith. They did it for me … they did it for us! It is these acts of sheer bravery and courage that gives me a sense of pride and a sense of purpose. As Bhai Sukha and Bhai Jinda so eloquently wrote in their letter shortly before their execution, “Our entire nation has taken birth from the art of keeping its head on its palm.” This idea is so deeply ingrained in our way of life, that every day we stand before the Guru – on happy and sad occasions – every birth, marriage, or funeral, we recount the sacrifices of our ancestors in our ardaas, “Band-band katae, khopriaan luhaaian, charkhriaan te chharhe …” Our sacrifice and struggle is something we cherish. But I wonder, are we losing touch? Why is it that we can look back through our history and take pride in events that outsiders would call horrific, but recent events are too controversial? What makes it too heavy? Is it because it is so recent? [Is the Nazi Holocaust then, too recent?] Or is it because the enemies are not “Mughals”? Or maybe because we don’t understand the history ourselves? Whatever the reason may be, the result is an overwhelming number of youth who haven’t a clue what happened in 1984 – it is as though it never happened. And even those who have some vague idea of what happened have no understanding of what led to the events in 1984 and the grave human rights violations that have happened since. I understand how painful the events are, and some of the wounds haven’t fully healed, but since when have we have turned into a nation that sweeps its history under the rug? We all know what happens to “those who forget their history…”, and considering we are a community that has suffered several large-scale massacres throughout our short existence, one would think we would be more vigilant. My Jewish friends tell me they were taught the graphic realities of the Holocaust at an early age. It was ingrained into their psyche. This idea of “Never Again” became part of their character. Every Jew – young or old – anywhere in the world could identify with the Holocaust. Their struggle seemed to strengthen them, individually and as a community. While much of our community would prefer to forget 1984, I cannot – I am a product of it. At a young age, I did not have much of an interest in Sikhi, but that period of time where Sikhi was being attacked inspired me to learn more – about my faith, history and people. I wanted to know exactly what it was that all these brave men and women were willing to give their lives for. The events and personalities of 1984 and the struggle for sovereignty motivated me to learn more about Gurmat and become more conscious of human rights violations and social injustice all over the world. Instead of forgetting our history, I chose to embrace it! There are many other “thirty-something’s” in the Khalsa Panth today, who have channeled their energy and emotion inspired by 1984 into productive work for the Panth, some of whom hold leadership roles in our civil and human rights organizations – safeguarding our rights every day. Some criticize me for “living in the past,” but I refuse to let this chapter in our history pass quietly. Especially as a parent, I do not want to shield my kids from our history – even if it is sometimes “too heavy.” I want my children to be just as equally inspired by the Battle of Amritsar as they are by the Battle of Chamkaur. I want them to know about the great sacrifices of the brave Singhs and Kaurs before them, so they can not only bask in the Guru’s love, but understand the responsibility that comes along with it. Last week, I heard an essay that I particularly liked called “America’s Beauty Is In It Diversity.” It’s the story of Alaa El-Saad, a 15 years-old from Austin, TX who shares her experience of wearing her Hijaab. It’s a simple story, but vividly reminded me of my experience wearing a Dastaar for the first time to school. What’s also special about this project is anyone can contribute an essay to share their beliefs. Many of these essays are selected for broadcast, posted on their website, and included in their collection of essays they reguarly publish. Another program I listen to is StoryCorps. StoryCorps is an oral history project where Americans share life stories with family and friends in designated StoryBooths throughout the country. Each conversation is recorded on a free CD to take home and share, and is archived for generations to come at the Library of Congress. As Sikhs living in the United States, we have amazing stories to tell. From our experiences wearing our Kakaars, the memorable conversations we’ve had with friends, co-workers, and even passer-bys inquiring about us, and also the difficult stories of discrimination and racism. Whatever it might be, our story needs to be told. I encourage anyone reading this to submit your This I Believe essay or book your StoryCorp reservation today! This is an excellent opportunity to make the Sikh-American story part of the American story.